In The Witcher 3: Hearts of Stone you can make friend with the people of Ophiri whose craftsmen, Runewright, using rune and Glyph can enchant your gear (sword and armor). Where you can find such craftsman, what improvements are there and what runes and glyphs you need it, we will show you in this guide. - Get your side quest "Enchanting: Start Up Costs" and go to the waypoint called New Mill in the North eastern. - Talk to him and he will ask you 5000 crowns for his tools. - Once you have handed him the amount, the next quest starts “Enchantment: Quality Has Its Price”. You must now find a chunk of jade. - First go to the building next to the tent of the runes blacksmith and grab a pickaxe. 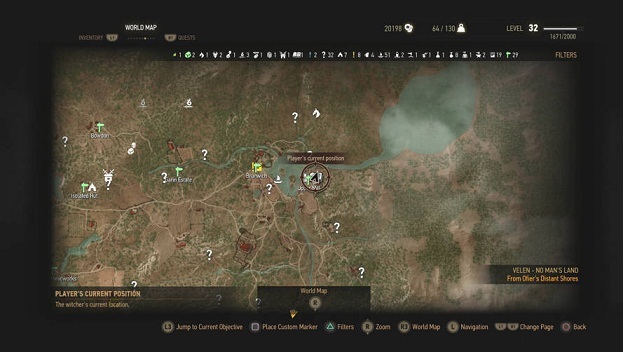 - Then select the middle of the three possible locations can be found on the map, located north of Novigrad, and enter the dark cave where you can expect Spider Bugs and the coveted Jade. - Return now to Runewright who has already built up his workshop in your absence. Give him your equipment to enchant. The Runewright gives you the ability to enchant items with Runewords and Glyphwords. However, the following guidelines apply. - Words can not be used simultaneously with single rune or glyph. - Runes and glyphs from the previous game will not fit on the new enchantments. - Only items with three pedestals can be enchanted. - Enchantments are divided into several stages. - You can apply Runewords only to weapons while Glyphwords parts are reserved for armor. Invest more crowns in the Runesmith, he will offer more Enchantments. Below you can see a list with all available enchantments. - Preservation: The bonuses of armourer’s table and grinding stones are permanent; Requires - 1x small Svarog-Runestone, 1x small Devena-Runestone, 1x small Morana-Runestone. - Dumplings: Runeword (Level 1) Foods consumed regenerate the vitality stronger by 100%, but taste invariably after Pyerog; Requires 2x Pyerog Runestone, 1x Tvarog, Hand Cheese, Runestone.